Thursday’s Thoughts ~ What A Proposal! Whoa! Have you seen this YouTube video of one guy’s recent proposal to the love of his life, whom he lovingly refers to as “Sweet Pea”? Isaac’s proposal took place last week, on May 23rd, and was featured on CBS This Morning this past weekend. As of this morning the YouTube video has already gotten 9,390,070 views–and it’s only been posted on YouTube for six days! If you haven’t seen it, you should take a moment and check out this man’s elaborate way of proposing. All of the participants in the video are friends and family of the couple–including those people featured on the laptops, who wanted to participate but couldn’t be there in person! Watch and enjoy! Since the proposal was so elaborate, it kind of makes you wonder what the wedding day will be like, doesn’t it? Welcome! Thank you for stopping by for another edition of The Wednesday Hodgepodge! Here are Joyce’s questions for the last week of May. (Thanks Joyce! ) Can you believe it’s already the last week of May??? Me either! Show some respect when members of our military come by in a parade! Also, the simplest kind act of saying “thank you for your service” to a vet or active military person would probably mean a lot. Sending cards, letters, or even care packages to our deployed military people is another way of honoring them, showing our support, and saying “thanks”. I especially like “The Wounded Warrior Project”, an organization which provides help and support to soldiers who have been injured in the line of duty. 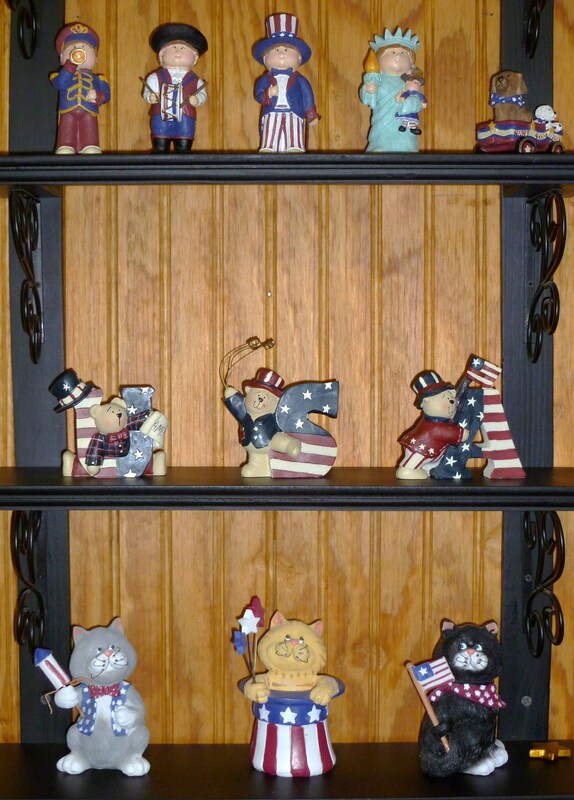 I own a red, white, and blue t-shirt, and I also have lots of red, white, and blue patriotic decorations scattered around the living room– in honor of Memorial Day and Independence Day. I’m not really sure that “love does conquer all” in every situation, but I sure like to believe that it can, since I’m a romantic at heart. Sometimes I do share some personal stuff with my hairdresser, but not any really personal stuff. I tend to stick with a hair dresser until she either quits or moves on, so we usually get to know each other pretty well. I hate changing hairdressers! Yes, I think money does lead to selfishness sometimes. It’s just our human nature to be “greedy”–and when money is involved one’s “true colors” often tend to come shining through. The words “death” and “inheritance” come to mind whenever I think of the words “money” and “selfishness”. That would have to be the chest of drawers in Ed’s room. It’s very old because it used to belong to my parents. The drawers tend to stick, the finish is bad, and a couple of the handles have recently broken! Of course, it could also be the “cedar wardrobe” in Ed’s room that once belonged to my paternal grandmother. (Ed wanted it after my parents died.) The wardrobe has a bad finish as well, and one of the doors won’t stay closed, but Ed likes it anyway. Have I ever mentioned that Ed loves “old things”? I decided to set some of my favorite family beach photos (from trips we’ve taken over the past 4 years) to what I consider the “perfect beach song”–“Knee Deep In Paradise”. Such fun times! Watching this video sure makes me want to go to the beach again–sometime soon! How about you? Have you been knee deep in paradise lately? I hope everyone had a nice, long, Memorial Day weekend. I took three days off from blogging, so I haven’t caught up with what everyone else has been doing yet. I plan to do some visiting today. It’s raining cats and dogs outside today, so it’s a good day for reading! We spent an unusual holiday weekend here. First of all, we made no plans for the entire weekend. No cook outs, no family gatherings. It was a little sad, but we have family cookouts, fairly often, so it’s okay. The truth is, I just didn’t feel like entertaining a crowd this weekend. We saw everybody, at one time or another, over the course of the weekend, but not all at one time–and I didn’t have to cook or clean up the kitchen. For most of the weekend, Ed and I sat around watching to see what tropical storm “Beryl” was going to do. “Beryl” managed to keep our weather in a turmoil for two of the three days–and it’s not over yet. One minute it would be sunny, then suddenly it would turn windy and begin to rain. This pattern repeated itself for two days! 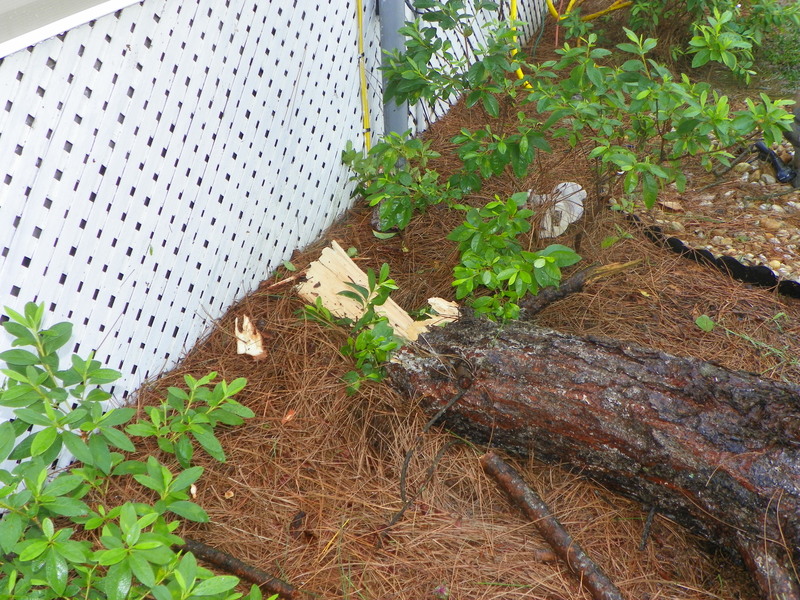 The crazy weather kept me on edge–especially after that freaky storm last Tuesday caused three of our trees to fall! I was amazed at the number of people who gathered on the beaches (and in the water) despite the tropical storm warnings and rough seas at the beaches in our area. I hate sitting on the beach when the wind is blowing sand in my face! The local news reported that there were 38 rescues from the water on Sunday alone! What the heck?! I think many people have taken leave of their common sense sometimes. I didn’t start out the long weekend feeling my best, and neither did our youngest son, Brad. My health complaints were just the usual stuff, but Brad had been sick with a sore throat and high fever since Wednesday evening! After two doctor appointments, and a few doses of antibiotics, by Sunday evening Brad was beginning to feel better. Speaking of Brad, I haven’t mentioned this, but he’s been working out-of-state for several weeks. He’s been working four hours away, so we only get to see him on weekends. Jennifer, his wife, goes to be with him, whenever her work schedule permits. She stays in South Carolina on her days off, then heads back to work from there, after her days off end. When Jennifer doesn’t have days off during the week, she takes turns staying with different family so she won’t have to stay alone. These past few weeks have been difficult for the couple, but hopefully this out-of-town job is nearing completion! Brad and Jennifer have to leave for work at 4 a.m. when heading back to work to-or-from South Carolina. I worry about both of them being on the road at such a ridiculous hour. It began to rain heavily at 4 o’clock this morning. It woke me up, and I immediately worried about Brad having to drive 4 hours in such rotten weather. I hope he made it there safely. It’s been a little over thirty-six hours since the surprise storm blew through our yard on Tuesday. I’m not quite sure if it was just a storm or a small tornado. I’m thinking small tornado because the damage seemed to be so sporadic. We lost three large trees, while our daughter next-door only had a few small limbs, and a broken piece of toddler playground equipment in her yard. 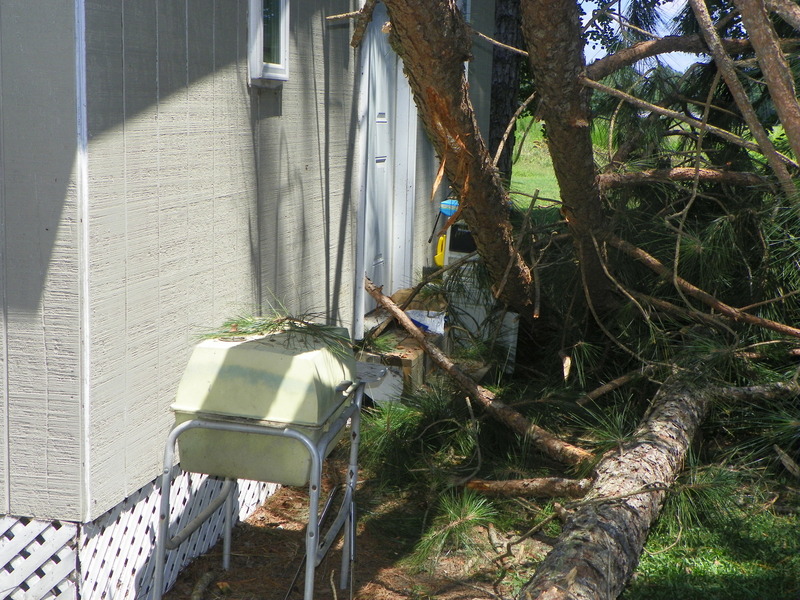 Our oldest son, who lives directly in front of us, lost two smaller trees, and had his lawn furniture strewn all about. 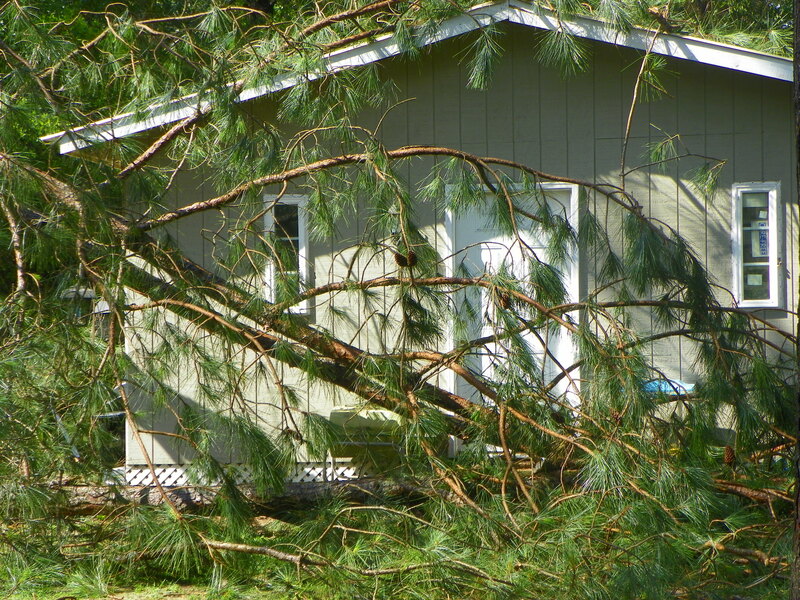 A couple of other nearby neighbors suffered some damage–one large oak tree uprooted, and a mangled trampoline—while most others remained untouched. Ed came home from work on Wednesday afternoon, and began cleaning up most of the debris out of our yard. Some of the fallen trees were blocking access to our storage building, and needed to be moved quickly. We still have three very tall tree trunks standing, but all of the fallen limbs and tree tops have been removed! Yay for a helpful son-in-law who pitched in to help Ed get our mess cleaned up before dark! When I went to check on the dolls out in the garden (who were placed there to scare away deer), I discovered that “Spooky Dude” was missing his head and one hand! I figured I’d never find his head, but luckily it was laying right beside his body! At the moment, “Dude’s” still missing those body parts because nobody’s had time to re-attach them yet! The wind had completely turned the doll around, so that she was now “mooning” anyone passing by! Notice, however, that the wind did not blow Ed’s hat off of her head! How strange! I straightened “The Doll” up and placed her back in a more “respectable” position. She’s now waving instead of mooning! Speaking of the doll–we’ve gotten a few strange looks and comments from people passing by on our little dirt lane! Most think she’s just “creepy” looking…I hope the deer agree! Today it will be back to business, as usual. I’m feeling a bit better (after “Uncle Arthur’s” visit), so I’ll be heading out the the garden to pull a few weeds–but only a few. Our garden may look a little “rough around the edges”, but it doesn’t have to be pretty to provide food. 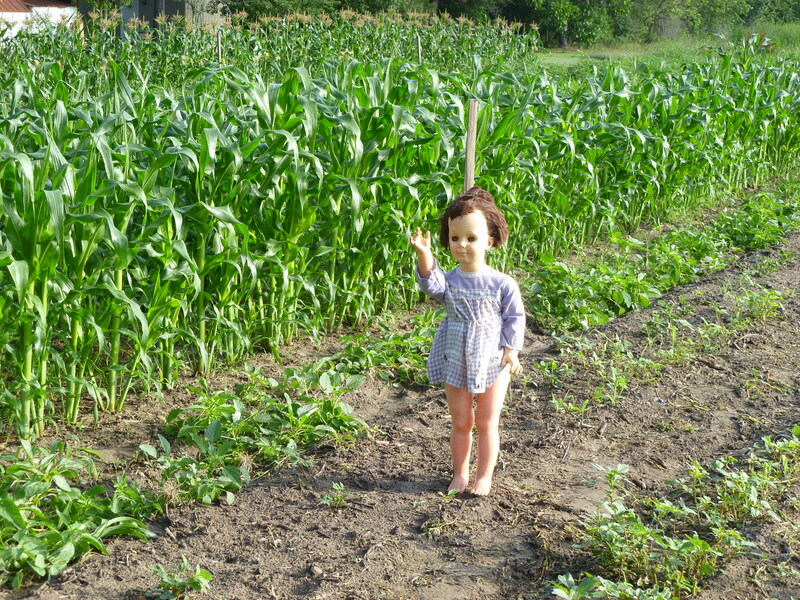 I still see lots of little peas and beans coming on those vines, and it doesn’t bother me a bit if the corn is crooked–just as long as that doll stands up straight and behaves herself! 1. What’s something you miss about the 1980’s? If you’re too young to miss the 80’s how about the 90’s? The thing I miss most about the 80’s is being the young mom of three little ones! Our house was very full and lively! I was in “mommy mode” times three! 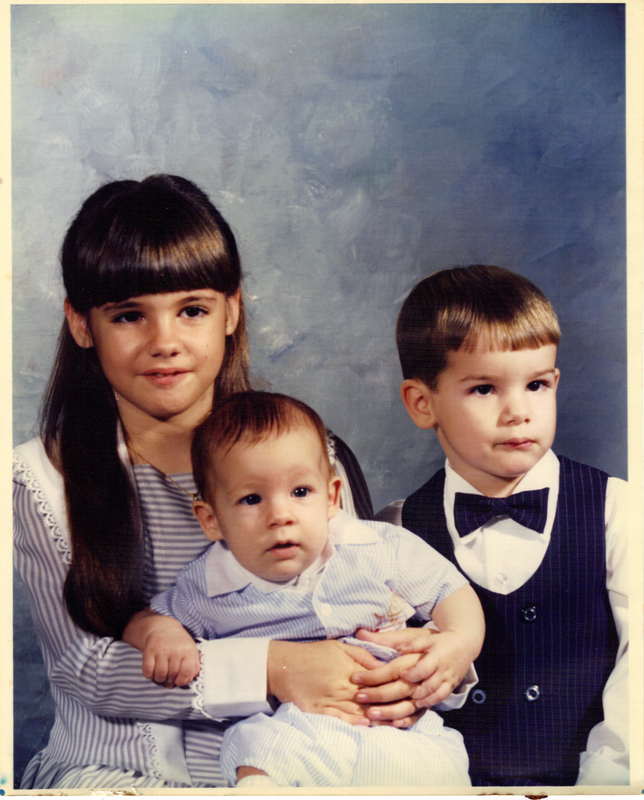 Two of our children were born during the 80’s, while our oldest was born in 1978. Those were the days, my friend…I thought they’d never end–but they did..too quickly! Yes, I do have a library card, but it’s been years since I’ve used it. I prefer to buy the books I read, then add them to my ever-growing library. I haven’t visited our library since our granddaughter out-grew story time a couple of years ago. 3. What’s the secret to success? If I knew the answer to this question, I’d be a millionaire! 4. 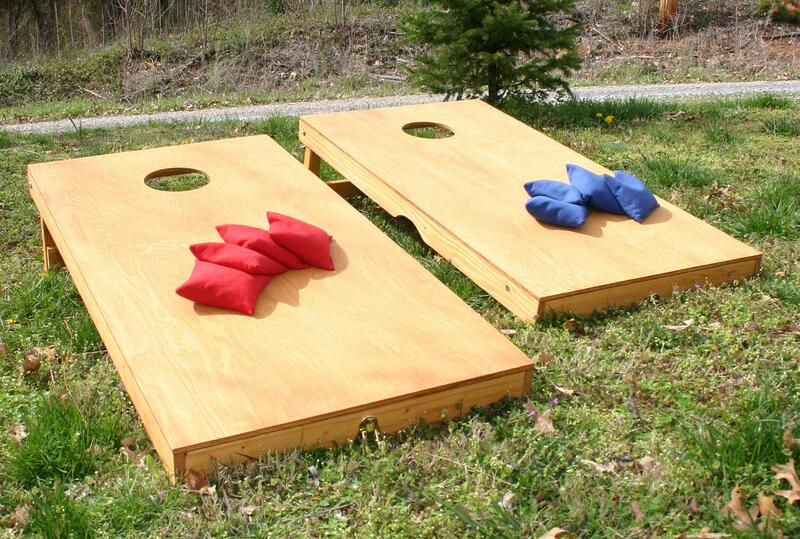 This is National Backyard Games week…what’s your favorite backyard game? I’ve turned my former (wedge-shaped) coffee table into an end table between our two couches, and it holds a lamp, my laptop, and various other things–like junk mail, nail clippers, and a pair of ear buds. Oh, and lots of magazines on the bottom shelf! Yes, I do own a bicycle. It was a Christmas gift a couple of years ago. I do enjoy riding it, but it’s been a few months since I’ve been on it. 7. What’s your favorite cheese? Nothing fancy, just plain old mild cheddar makes me happy. While sitting at my computer answering these Hodgepodge questions on Tuesday afternoon, a storm blew up. At first, I didn’t pay a lot of attention because bad weather doesn’t usually frighten me…Then I heard a cracking sound outside of the bedroom window! a bit too close for comfort! 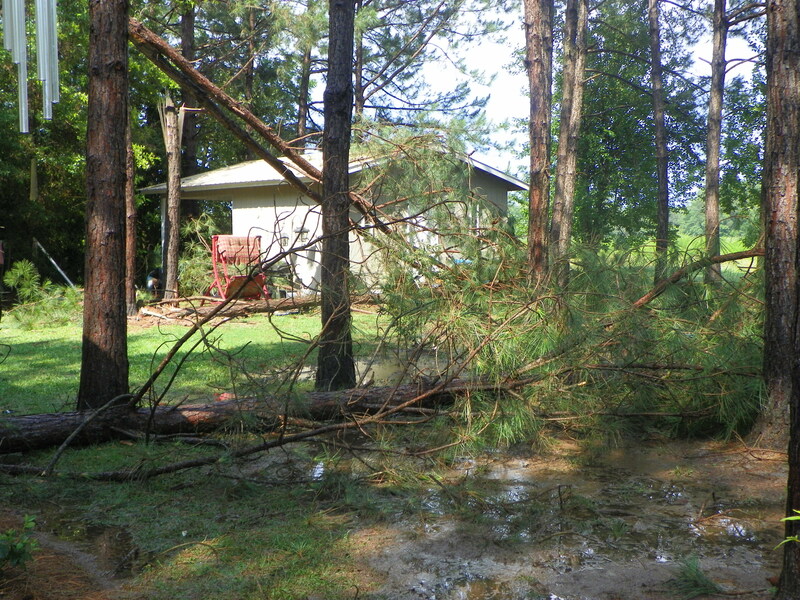 I looked outside and discovered a large pine tree had snapped in half and fallen. While I was trying to figure out exactly what was going on outside, I saw two more huge pines snap and come crashing to the ground! At that point, it also began to hail, so I headed for the bathtub and laid down in it ’cause I wasn’t sure what was going to happen next! All three of the trees fell within mere inches of our house and storage building, but fortunately there was very little damage. God is good! Let the clean up begin…our yard is a mess! Just over two months ago, I became the “mother” to six cute, fuzzy, baby chicks, and thus began the adventures of “My Girls” and me! The first few days and nights of our adventure together were spent within the confines of a plastic storage container located in my husband’s pool room. A lot of eating, sleeping, and “pooping” went on inside of that box! A 75 watt bulb was attached to the box, and it burned twenty-four hours a day keeping my new babies warm. I even played country music for my babies because I didn’t want them to be lonely whenever I was busy! After three weeks of having “my girls” living indoors, and trying to keep them inside of their “chicken condo” (I’d actually had to place netting over the top to prevent them from escaping), the time finally came to move them outdoors to their brand new “chicken palace” that my husband built for them! I tell you, that first night was a long one for this “chicken mama”! I walked back and forth checking to make sure “my girls” were warm and cozy in their new home. 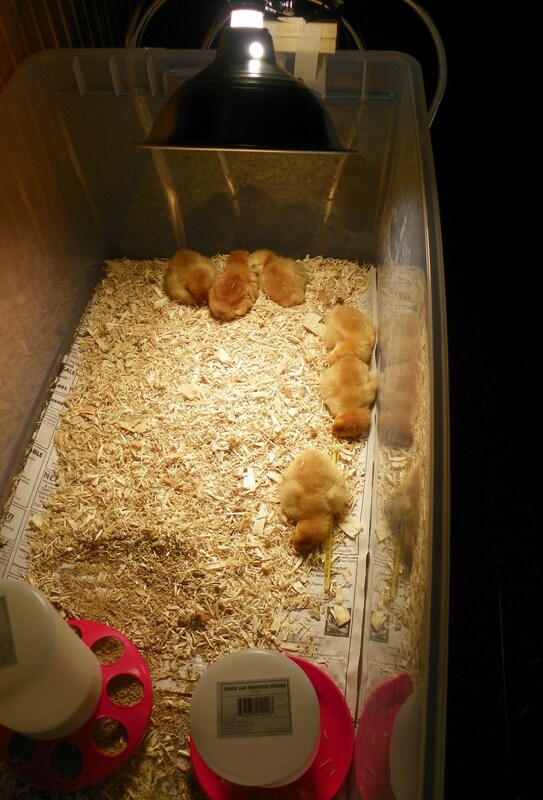 After moving outside, “my girls” continued to sleep under a light bulb in the hen-house because the nighttime temperatures were still cool, and the chicks still didn’t have all of their feathers. I also put a small section of their former cardboard condo inside of their chicken pen. During the day, I’d move the light into this box so “the girls” could warm themselves when they became chilly. Giving up this box became quite “an issue” with my girls…sort of like giving up a security blanket! Another happy day was when all of “my girls” finally learned how to climb the ladder of the hen-house, and go to bed on their own! This happened about the same time they learned to sleep in the dark. I can’t tell you how aggravated I used to get trying to catch those six chickens at night to put them to bed! There was always one rebel chicken every night who refused to cooperate! I nicknamed her “Renny Henny” because that girl is such a renegade! After a couple of weeks of chasing chickens at night, I mentioned to Ed that I didn’t think the chickens liked sleeping in their hen-house because they felt trapped. The hen-house had windows, but they were located up high. 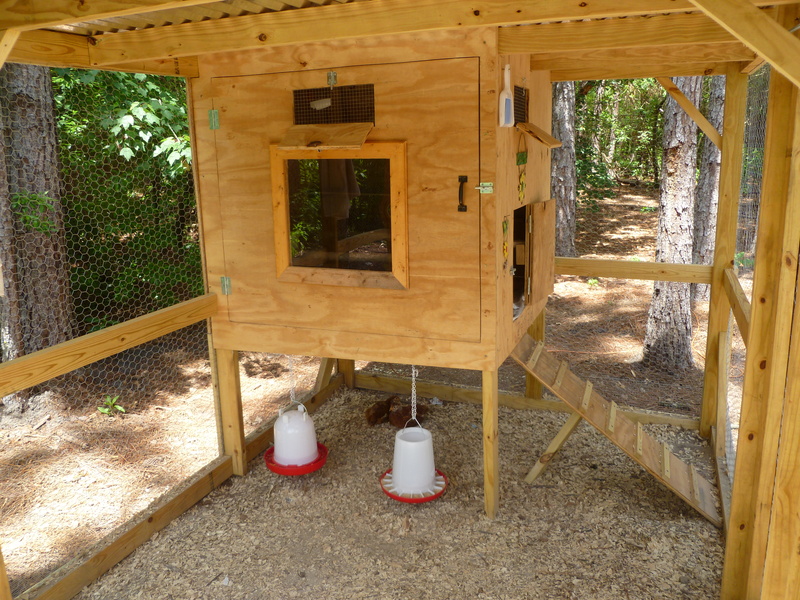 We decided to add a “picture window” to their hen-house, so they could see outside. That picture window did the trick! Within a day or two of adding a large plexiglass window, the chickens were voluntarily going to bed on their own, but Renny Henny is still the last to go to bed each night! At night, I love seeing the hens all lined up on their perch happily looking through their new picture window! “My girls” still come running whenever I call “Hey girls!” In fact, they come running, even if I don’t say anything, because they associate me with good things to eat! 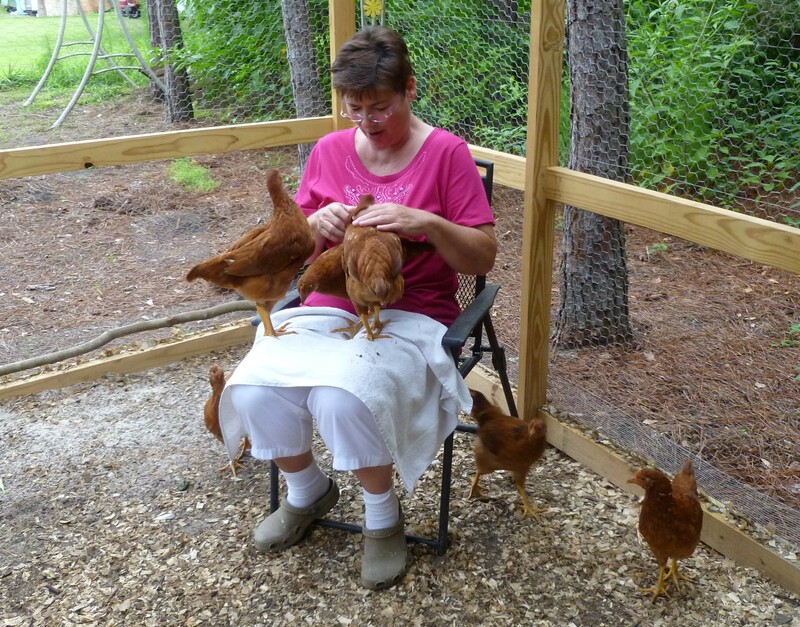 I feed them treats several times a day, and I also keep a chair inside of their coop for my frequent visits. I love to just sit and watch them. “My girls” enjoy sitting in the chair, too, whether I’m in sitting with them or not! 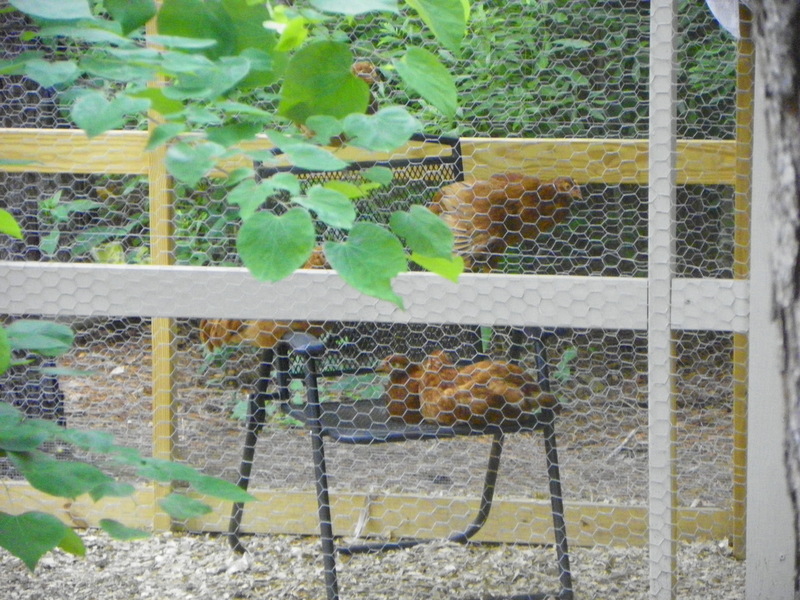 I’m in the process of painting the chicken coop, and “the girls” currently have several decorative touches located throughout their coop–in addition to the chair and picture window! They have a “welcome” sign over their door, and two wind chimes hanging from the top of the coop!!! As the temperatures here continue to rise, they might even get their own fan before the summer’s end! 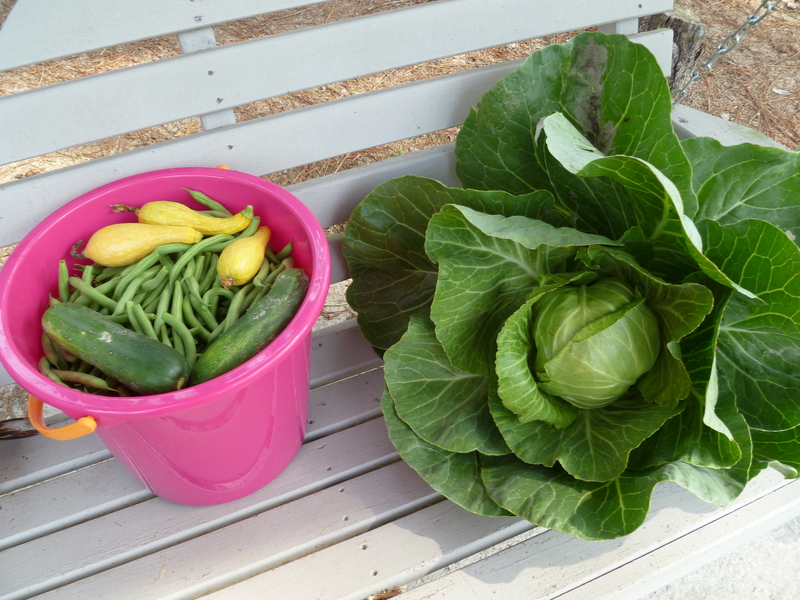 Thanks to our bountiful garden, “my girls” always have plenty of fresh vegetables to eat–and some weeds and grass, too! 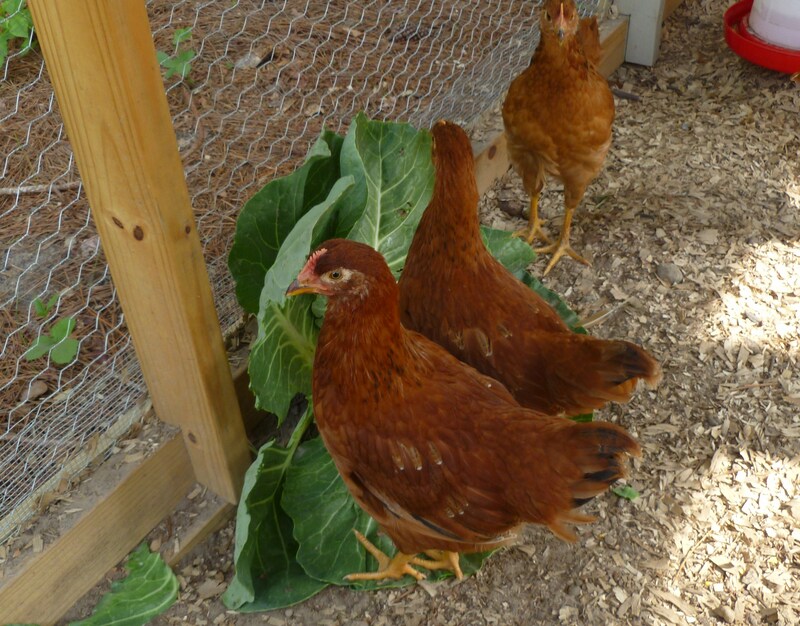 Whenever anyone comments about how fast “my girls” are growing, I always say, “It’s because all they do is eat!” Fresh cabbage leaves seem to be one of their favorite treats–oh, and grasshoppers, too! All of “my girls” look exactly like little red hens these days. 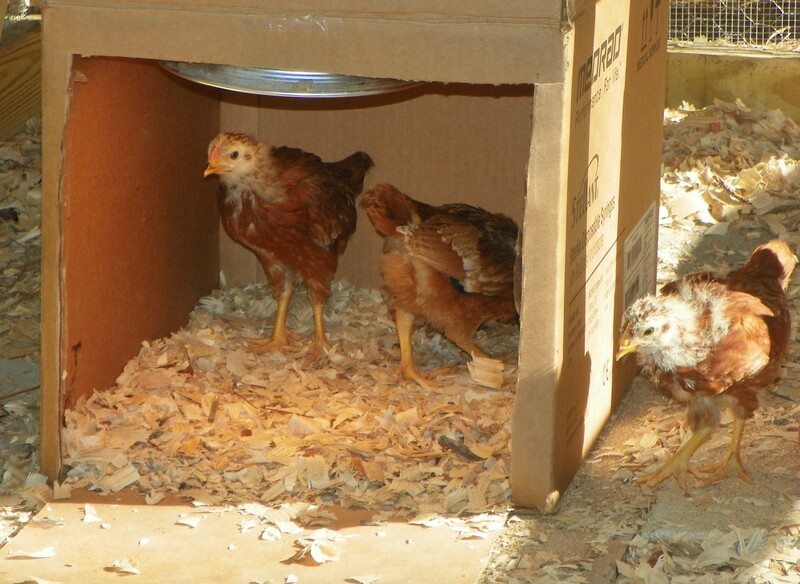 They remind me of the story, “The Little Red Hen” as I watch them busily scratching! 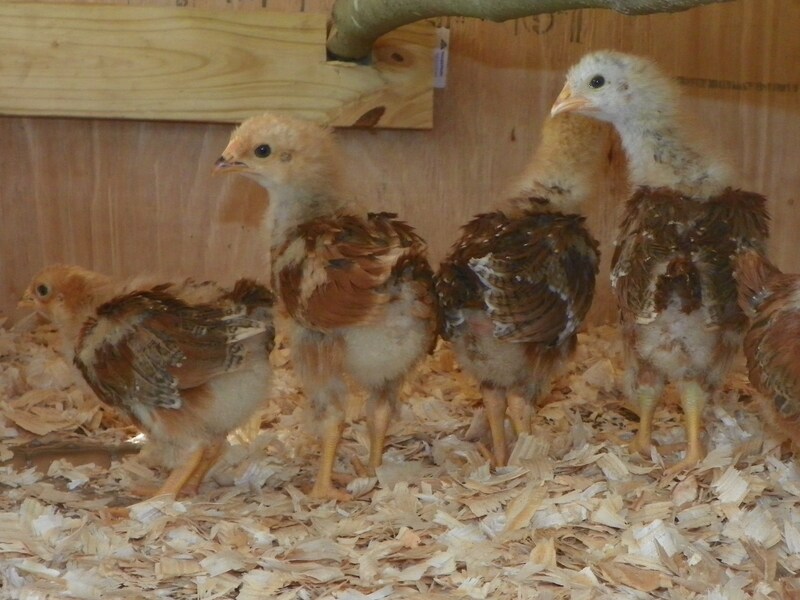 “My girls” are growing rapidly, but it will still be several more weeks before they will be old enough to lay any eggs. They’ve already learned how to “sing” and sometimes I hear the beginning of a “cluck” every now and then. “My girls” are probably the equivalent to human teenagers right now! I can hardly wait to see what kind of adventures the next phase of their lives will bring! I wonder who will be the first to lay an egg?! 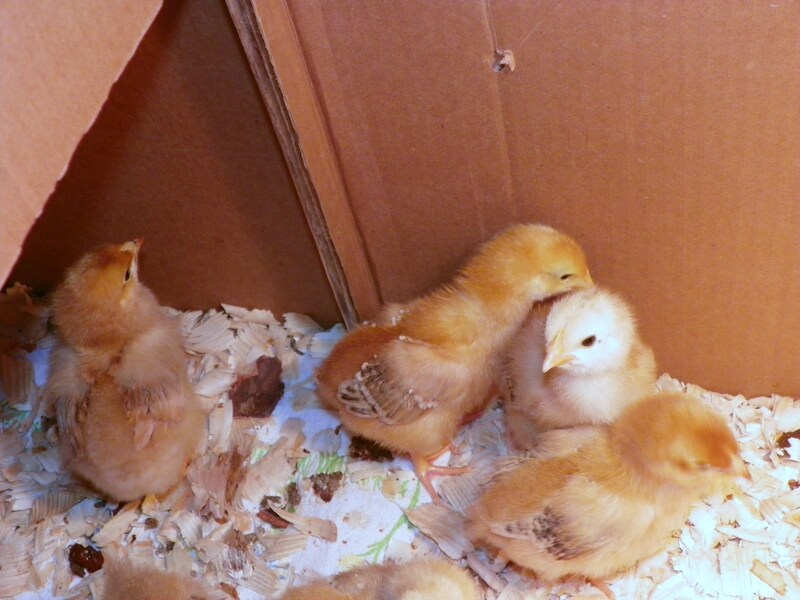 Who knew that raising chickens would be such an adventure–and so much fun, too?! Just in case you didn’t know…today is the beginning of a brand new week. It also means the ending of yet another week! These weeks, they do pass quickly, don’t they? 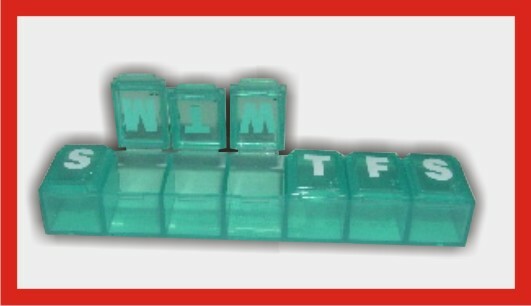 I’m made even more aware of the speedy passing of a week, by the constant need to refill my little “medication reminder”–you know, the little plastic box that holds a week’s worth of daily dosages of medications. Perhaps you haven’t been introduced to the “medication reminder” yet, and if not, you are blessed! Quick! Enjoy a normal life while you still can! My husband, Ed, says he is constantly reminded of how quickly time passes by the frequency he has to get our prescriptions refilled! He doesn’t use a “medication reminder” yet (although he really should! ), but he takes medication on a daily basis, too. Between the two of us, he makes at least three trips to the pharmacy per month. Oh the joys of getting older, and developing health issues like high blood pressure! Speaking of health issues, after nearly three months of total bliss– in the absence of my dear friend, “Uncle Arthur” (aka rheumatoid arthritis), my life was made miserable this past weekend with his return! “Uncle Arthur” does me that way–he comes and he goes. I’d been in remission since sometime in February–until last week. Perhaps picking 55 quarts of green beans had something to do with “Arthur’s” return, or the change in weather?! Unfortunately, “Arthur” has a mind of his own, and doesn’t need a reason to visit. Whatever the cause for “Arthur’s” recent visit, I hope it will be a brief one! Also, on the subject of health and growing older…Lately, everyone in the family has been remarking how much Ed has begun to look like “Grandpa” (Ed’s daddy). Even Ed’s mom says he looks just like her late husband. I’ve noticed it, too. Due to his thinning hair, Ed now has to wear a cap whenever he’s outside (or risk getting his scalp burned), and he’s usually dressed in the same type of attire that his dad used to wear around the farm–dark blue slacks (with cuffs), and a long-sleeved, plaid shirt. The other day I looked outside while Ed was sitting under the car port minding the pressure cooker. 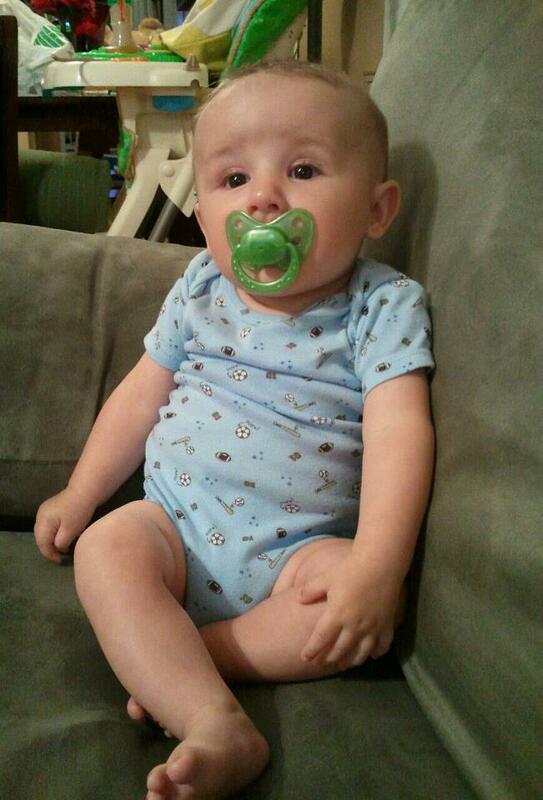 He could have easily passed for his daddy sitting there! How many times have I seen my father-in-law sitting outside watching a pot boil–except his pot usually contained boiled peanuts–not green beans! I walked outside and made the following comment to Ed. I said, “Sometimes I feel like I’m married to your daddy now! Do you feel like you are married to my mother?” He quietly answered, “Yes.” Ha! Who would’ve seen this one coming when we married nearly forty years ago?! Now, I didn’t ask Ed to elaborate on why he feels like he is married to my mother...some things are just better left unsaid! 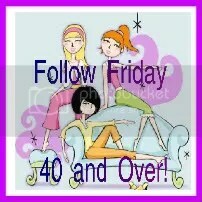 I’ve said it before, and I’ll say it again–“Oh, the joys of getting older! Married to our parents, who would’ve thunk it?! Around here, many things are winding down, as we get ready for the beginning of summer. 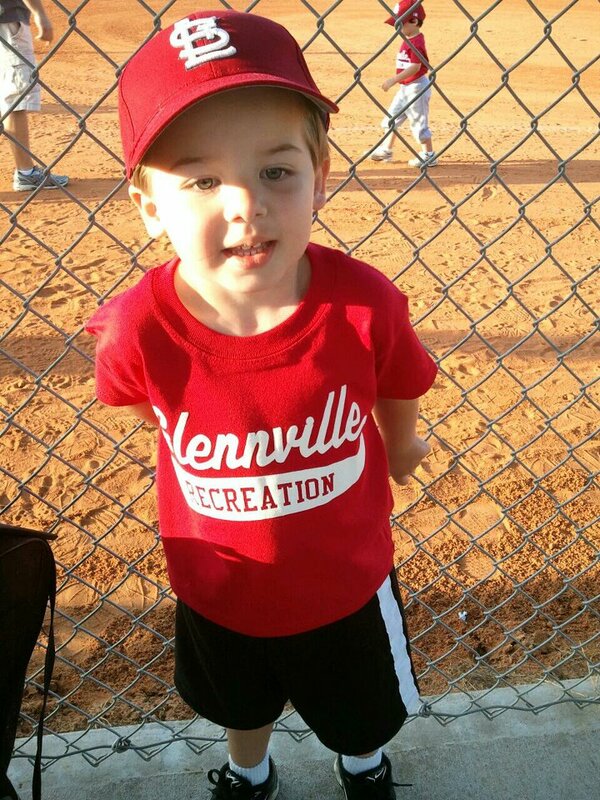 Grandson, Caden, played his last T-ball game on Tuesday. Ed and I took granddaughter, Madison, with us to watch his final game. Those little T-ball players are quite entertaining to watch! At one point, Caden hit the ball, then took off running after it! When you’re only 3, it’s hard to keep all of those rules of the game straight in your head. It wouldn’t be nearly as entertaining if everybody did what they were supposed to do! Following the T-ball game, Madison convinced us to take her out for supper–at McDonald’s! I have to take a moment and rant here. Thanks to Michelle Obama’s campaign for “healthier eating”, a trip to McDonald’s is no longer the pleasure it used to be! The “Happy Meals” are so small, it shouldn’t even be considered a meal anymore (more like a snack)–and there’s no caramel dip for the apples! The Happy Meal prize? It was a microphone/hairbrush! Really? 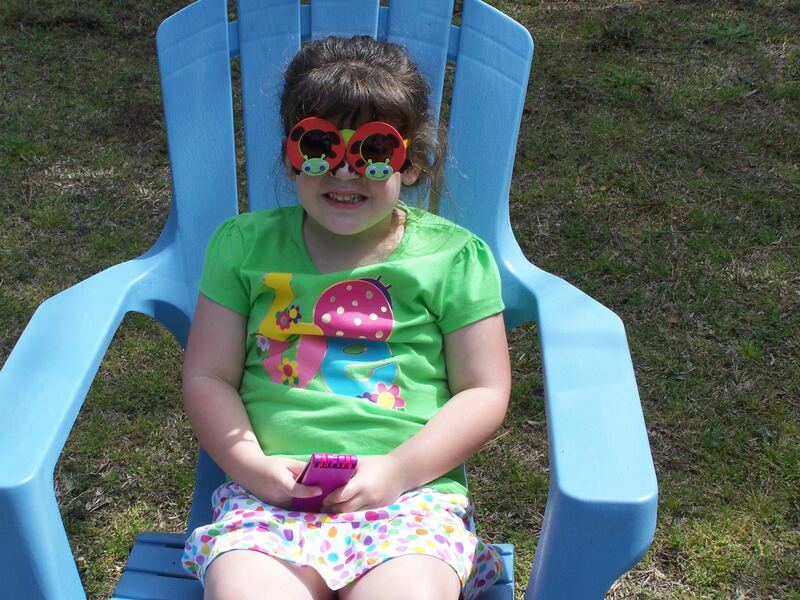 Speaking of winding down, Madison is also in her final week of pre-K. She “graduates” next Monday night. It seems like just yesterday when she was leaving for her first day of school! Madison has really learned a lot this year. She’s now beginning to read, and I love it! Have I ever mentioned how much I enjoy teaching/watching a child learn how to read? I think it’s the real key to success. When I wrote earlier about Mother’s Day, I neglected to mention what a nice Mother’s Day gift my daughter-in-law, Christina, received on Mother’s Day. As the family was sitting around relaxing after lunch, the newest member of our family, baby Chase, said “Mama” just as clear as day! It was priceless–and quite unexpected. Chase is only 4 1/2 months old. I’m resting and relaxing today, after another grueling day in “Bountiful” (our garden). 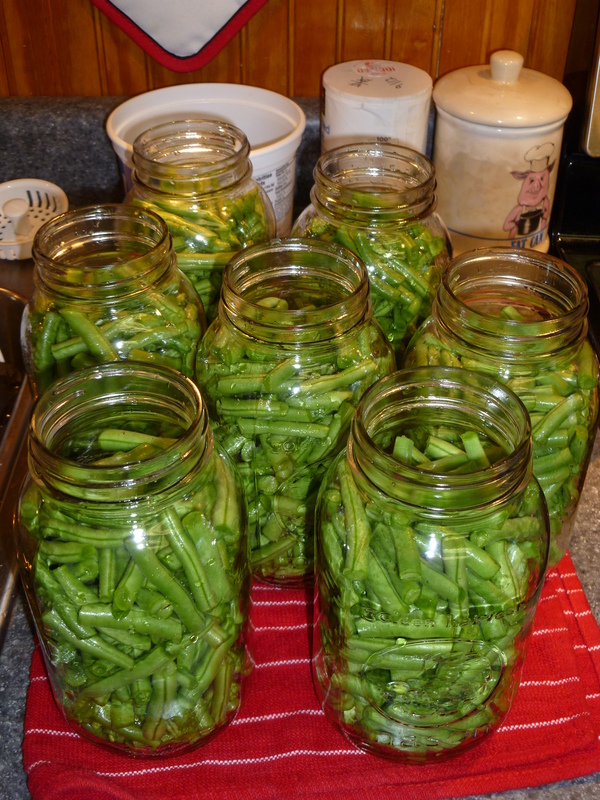 I picked and canned 14 more quarts of green beans yesterday! That puts the total up to 53 quarts of beans–so far. Yesterday, I noticed little butter beans on the bushes next to the green beans. Oh how I dread picking those butter beans, because it’s hard on the old back! Thank goodness for my little “Grasshopper” gardening stool! Speaking of grasshoppers–I take a jar with me whenever I go to the garden now. If I am quick enough to catch any bugs, who are busy eating my plants, I put them in the jar, and later feed them to my chickens! I normally don’t catch bugs, but the chickens are so grateful for their “bug treats”! Bugs are special to chickens, like candy is special to children! One night I went outside, with a flashlight, catching “tater bugs” (large hard-shelled bugs)! What a sight that must have been!!! Life in the country is never boring…especially if you live on a farm! Speaking of life in the country–our daughter saw a deer running from the garden on Tuesday. We couldn’t see any deer tracks or signs of anything eaten, so…perhaps our little doll in the garden scared it away! We added a “man” to the garden yesterday. 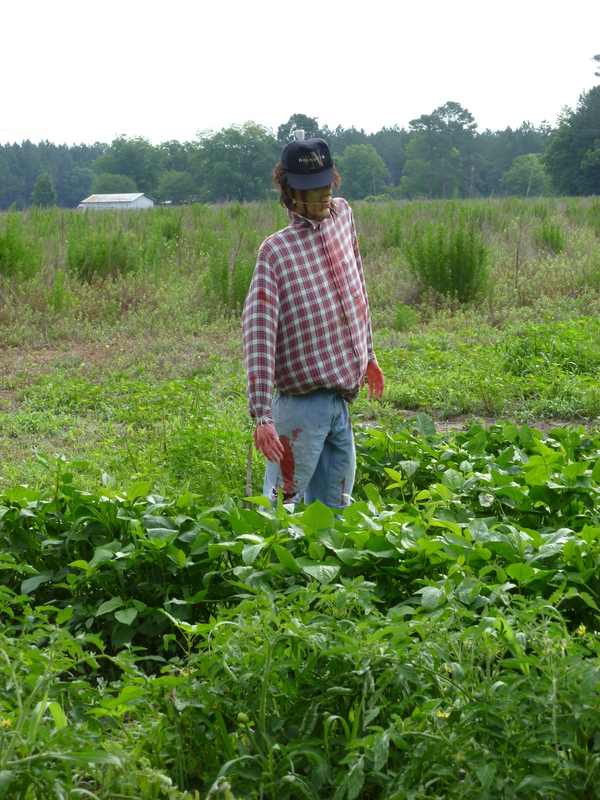 We dug our Halloween man, “Spooky Dude” out of storage, and placed him near the peas! I don’t know about deer, but this thing would certainly scare the daylights out of me! Okay, I suppose this is a good place to end this post! I need to get up and get movin’ anyway. Have a great day, everyone! Back From “Bountiful”…At Least Temporarily! Bountiful is what comes to mind, when I think of our garden this year! I had no idea how much of an adventure Ed and I would be taking when we began this garden way back in March! We started out with a few packets of seeds, a lot of determination, and not much else! Soon we found ourselves immersed in a field of never-ending activity–-and here we are beginning this adventure when most folks our age are retiring! I’ve really missed blogging the past few weeks! I thought about all of my blogging buddies while I was working my way through the dirt, weeds, and vegetables each day. I wondered how you were spending your days, while mine began–every morning at 8 o’clock–by applying a generous portion of insect repellent! Insect repellent has become my new perfume, and dirt has become my new best friend. We’ve been blessed with some much-needed rain lately. As a result, all of our plants have become lush and green. Due to the rain, and cooler temps, our harvest has been plentiful. Unfortunately, so have the grass and weeds! We try to stay in behind the weeds, but there’s only two of us versus thousands of them!!! H-E-L-P! It’s also hard to fit in weeding with all of the harvesting that’s been going on! Ed and I have spent many long hours working in the kitchen–and outside under the carport. 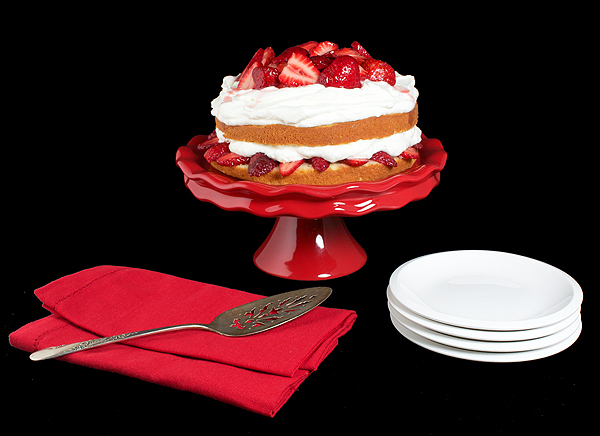 We’ve kept that new pressure cooker busy lately! In the past week or so, we’ve canned 33 quarts of beans, 18 pints of new potatoes, and six quarts of beef stew! Unfortunately, the deer have finally found our garden–sort of. Recently, one or more deer have been spotted near the garden. So far we’ve only had minimal damage. They’ve tasted a few young pea bushes on the end of the garden, and they’ve eaten some of Ed’s peanut vines on the other end. Yesterday I came up with a plan to thwart those deer visits–I hope! This was one of my old dolls when I was a child. She’s always been great at scaring the pants off of people in the past (because she looks so much like a child), so I figure maybe she’ll keep the deer at bay, too! The doll looks so real, our five-year-old granddaughter, who lives next-door, saw the doll standing on our front porch, and called to ask us why we had “that little girl” on our porch! Unfortunately, Ed chose to put the doll beside his peanuts, NOT beside my peas! I guess we know where Ed’s heart lies… He claims that he put her at the edge of the garden–where he thinks the deer are most likely to enter...We shall see! I just hope we don’t get reported by someone–for having a “child” tied to a pole in our garden! Wouldn’t that be a hoot?! Stay tuned…I’ll let you know what happens!